I love this savory, Mediterranean-inspired munchie featuring light and fiber-rich popcorn. Add a touch of Parmesan cheese (yum) and healthy rosemary and you have a nutritious and satisfying snack that’s perfect for movie-watching or desk-side nibbling. Enjoy! Spread out popcorn evenly on a baking sheet. Mist popcorn with olive oil spray until evenly coated. Sprinkle Parmesan onto popcorn and shake the baking sheet to ensure Parmesan sticks to the popcorn. Mist popcorn again with olive oil spray. 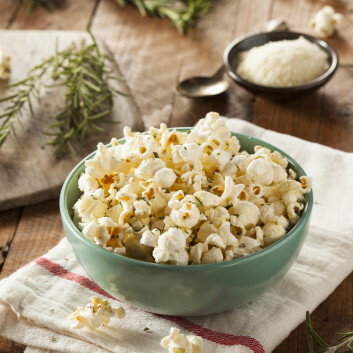 Sprinkle dried rosemary (mixed with a pinch of sea salt) onto popcorn, and again, shake the baking sheet to help all rosemary stick to the popcorn. Pour into a bowl and dig in! Don’t forget to try my Baklava Popcorn!